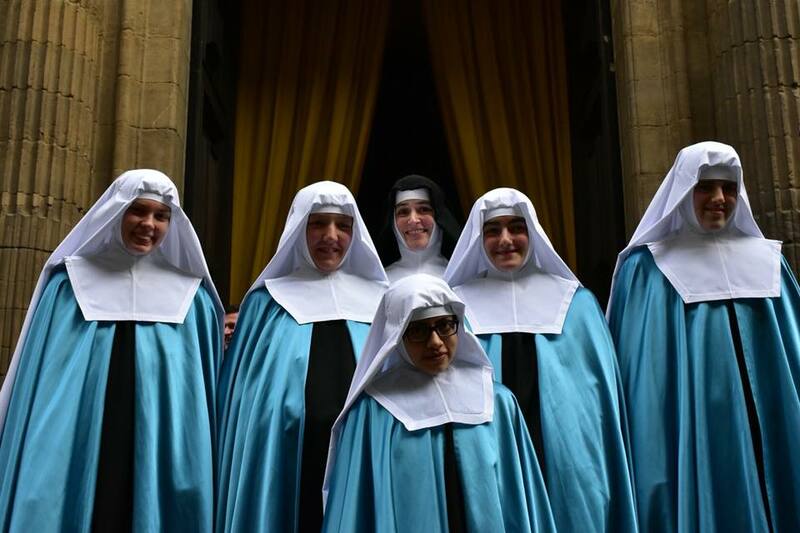 On Monday of this past week I was invited to preside at the clothing of five young sisters of different nationalities who belong to a recently-founded congregation, and whose full title is Sisters Adorers of the Royal Heart of Jesus Christ Sovereign Priest. 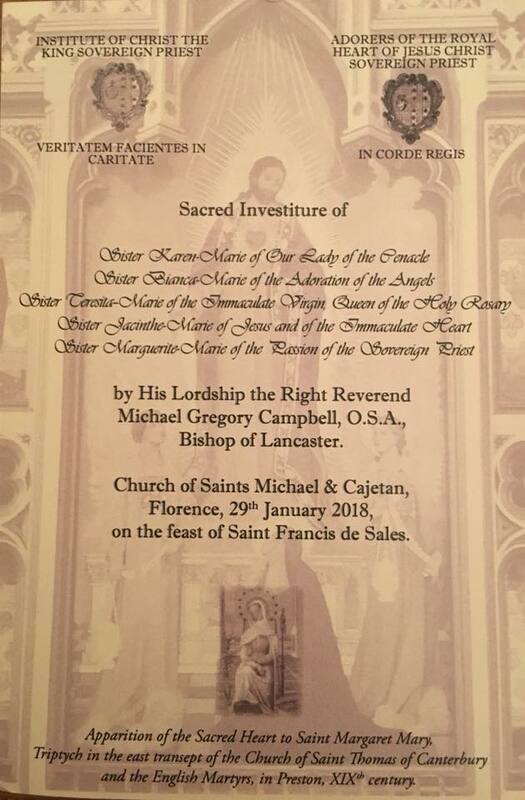 The Mass of Sacred Investiture took place in the church of St. Michael and Cajetan, Florence, in Tuscany. The novitiate of the sisters is situated in the countryside not far from the city, and close to the seminary of the Institute of Christ the King, Sovereign Priest. We are blessed to have sisters and priests of both Institutes with us in Preston. 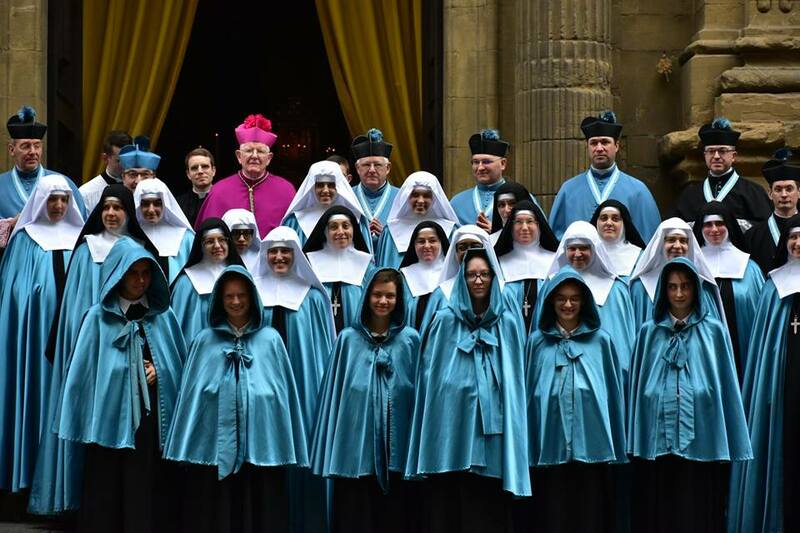 The ancient rite of religious clothing was a deeply moving ceremony for all present, not least for the young women themselves, their parents and families. 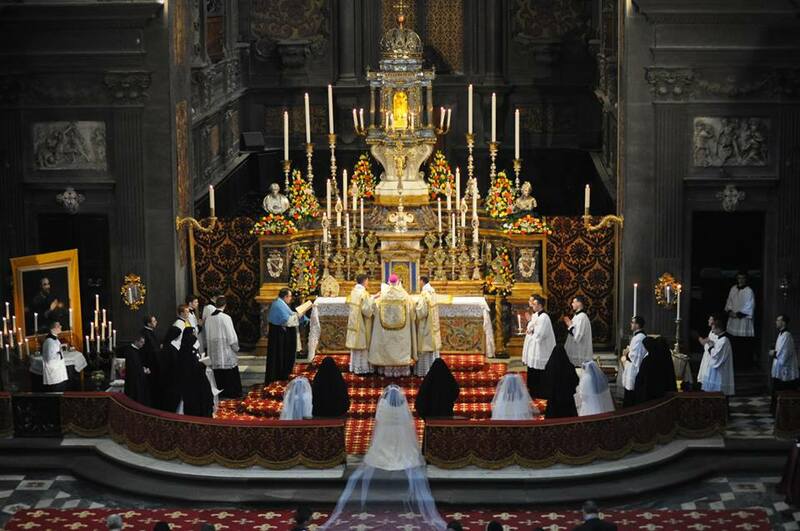 The overriding theme of such a liturgy is that of betrothal, and the offering of oneself to Christ as a bride, to belong to him alone. This bridal concept has deep roots in Sacred Scripture, for the prophets often referred to Israel in marital terms as the bride of God. St. Paul also taught that the Church is the bride of Christ, made pure and spotless through his death on the cross. 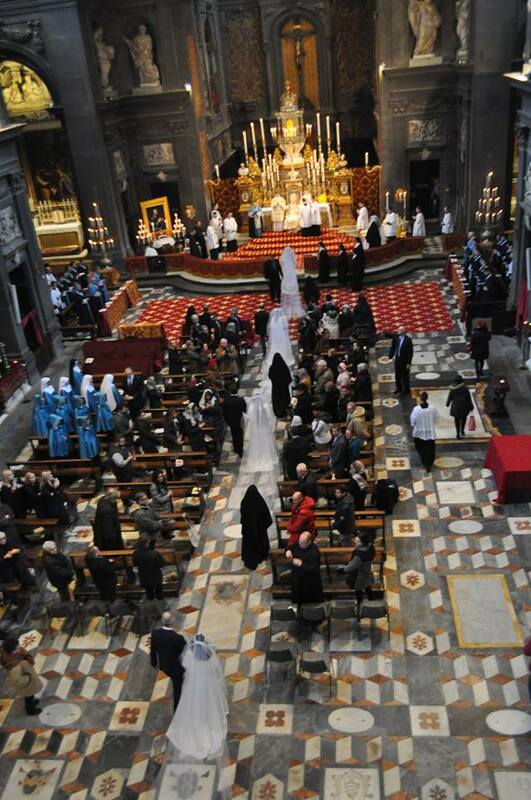 The procession to the altar of these five young women, escorted by their fathers, and arrayed as brides in wedding dresses was both a powerful symbol of their desire to belong exclusively to Christ, and a vivid reminder to the rest of of us that Christ must come first in our lives, whatever our own particular vocation. 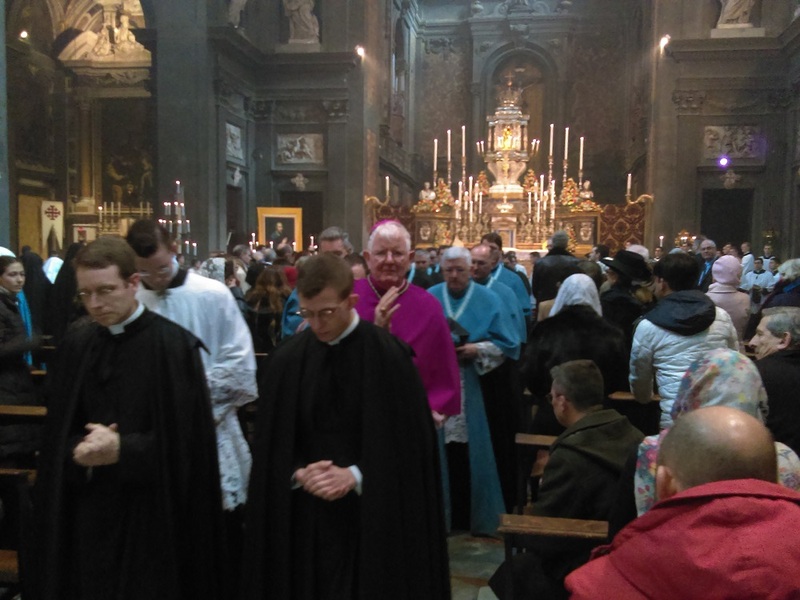 Assembled close to the altar, the novices, holding candles, in a few short responses individually expressed their desire before me, the bishop, and the congregation, to be a Sister Adorer. 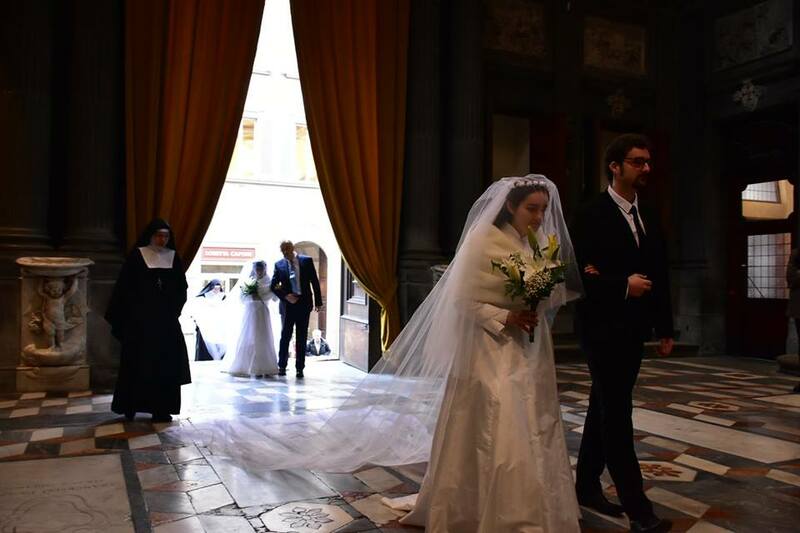 Before each sister received the veil, there was a symbolic cutting of the hair, which again was a deeply poignant moment, and a sign of that surrender and submission to Christ entailed in assuming the veil. 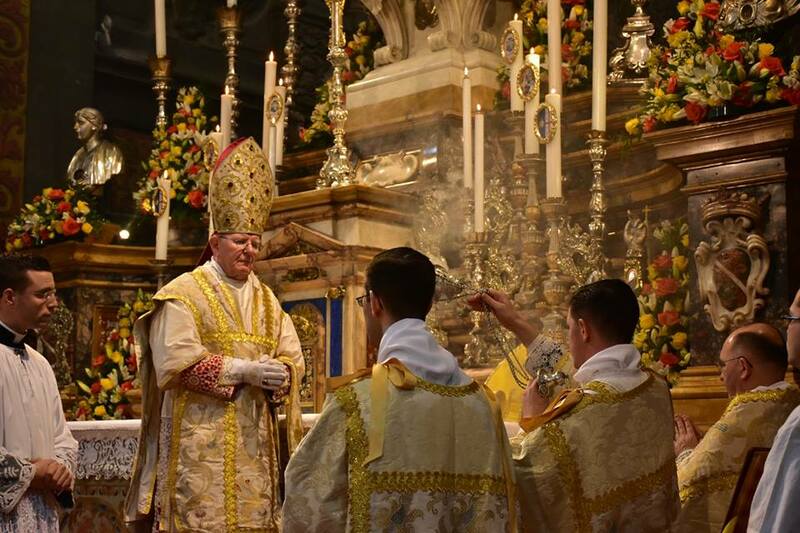 The young novices then retired to lay aside their bridal dresses and returned to the church fully clothed in their new religious habits and white veils, a further sign that for them a new way of life had now begun. 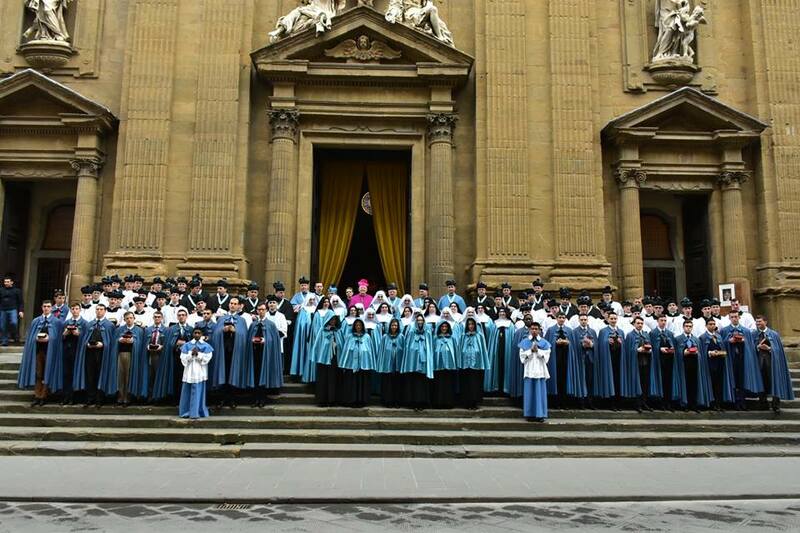 As the liturgy of this rite of clothing progressed I was struck by the counter-sign expressed in it. 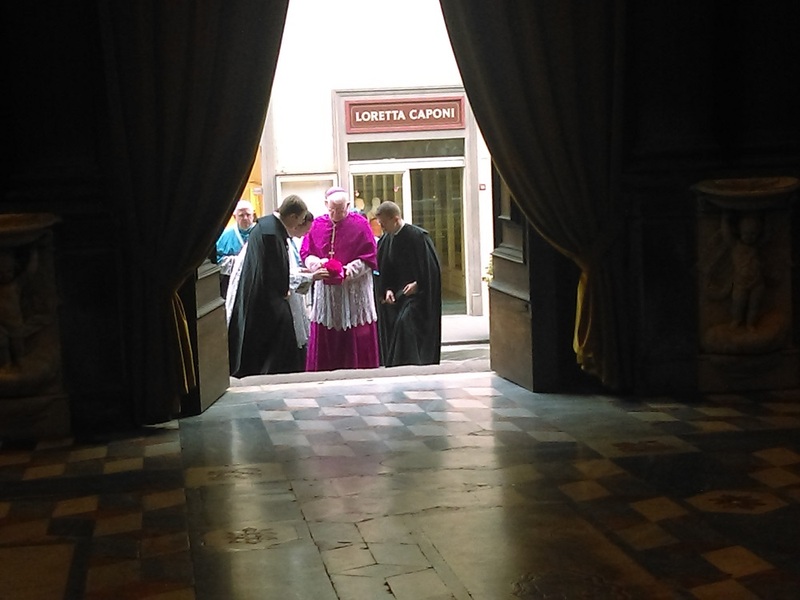 Christ still calls and his voice continues to be heard in the hearts of young people, especially in these newly clothed novices, and I reflected in wonder at their faith and generosity in setting out on such an arduous and challenging vocation. 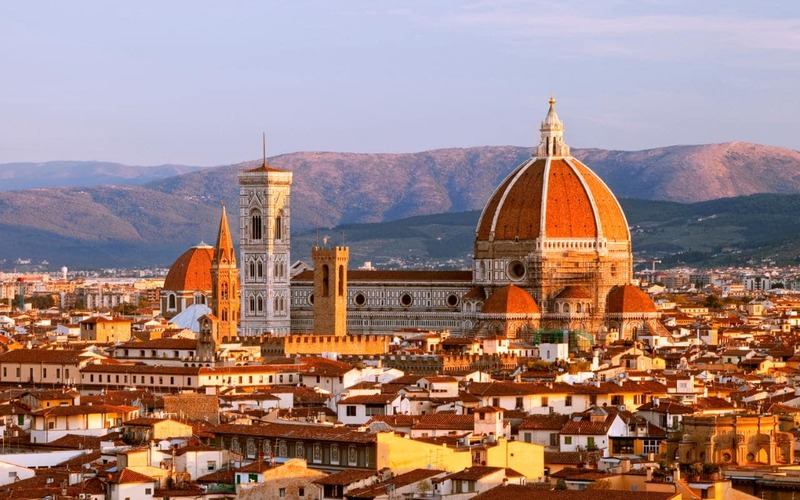 The city of Florence has a rich cultural, civil and religious history, and this lovely and hope-filled ceremony of the clothing of five young women marked a small but significant page in the long story of this fine city. We assure these young novices of our good wishes and the support of our prayers as they progress in the novitiate of the Sisters Adorers. 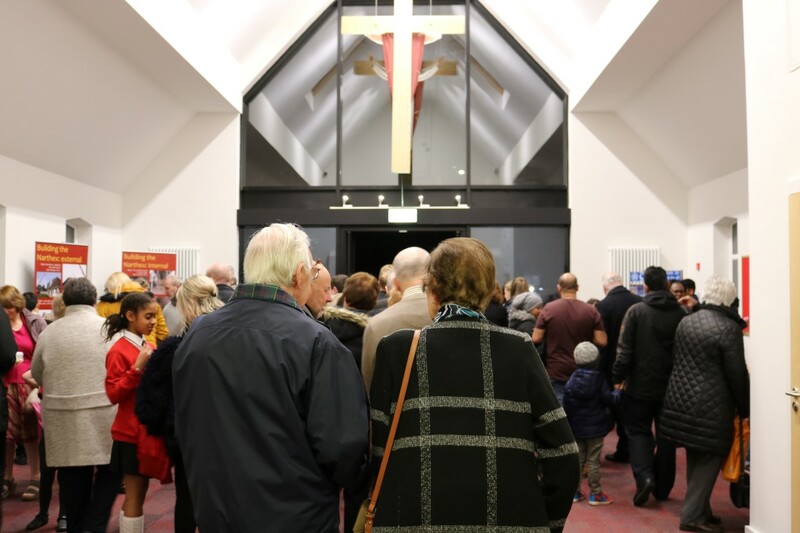 A ceremony of another kind took place on Thursday evening in St. Clare’s parish church, Fulwood, Preston, with the blessing and official opening of a new narthex, which is a very spacious entrance area leading into the church proper. The construction of this narthex was some time in planning before eventually being brought to completion. 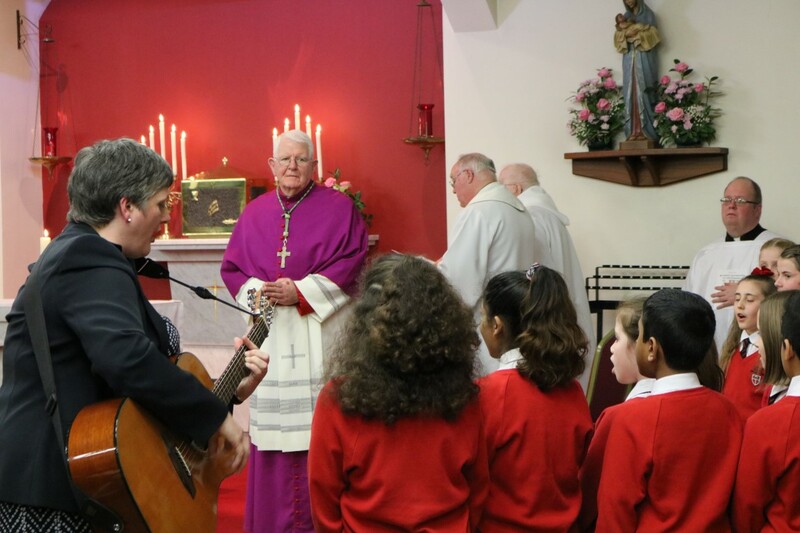 The packed congregation of parishioners young and old was an expression of their interest and delight at the addition of such a fine new amenity to the church facilities. 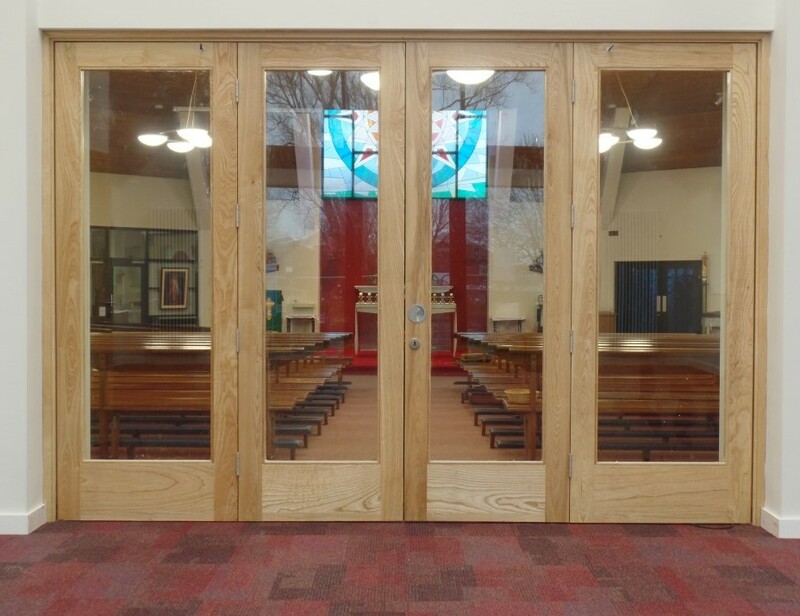 The church is close to the Royal Preston Hospital and this new enhanced space with its glass doors allows passers-by to catch sight of the sanctuary and the tabernacle, a visible reminder of the Lord’s presence among us. As the parish priest explained, the name Clare comes from the word for light or clarity, so the new narthex will enable the light of Christ to shine even brighter from St. Clare’s. Warm congratulations to all who have worked and supported this worthy project!